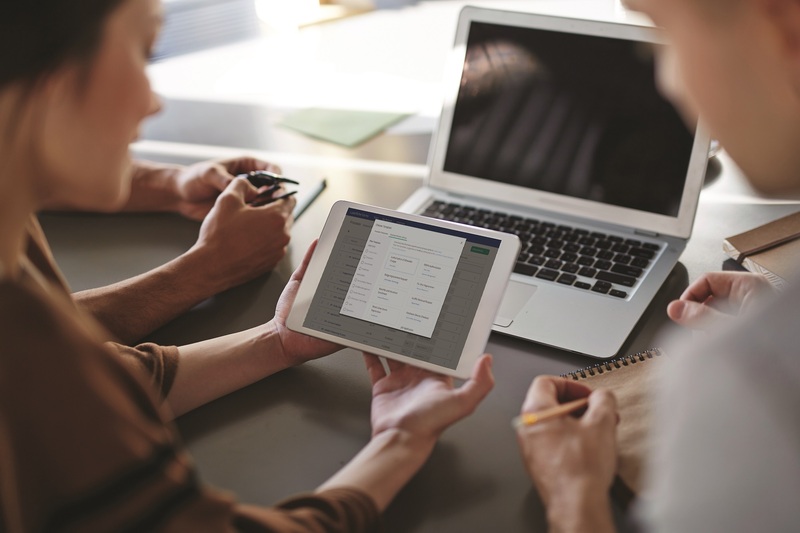 Laserfiche allows a document’s previous versions to be saved in the document’s version history. 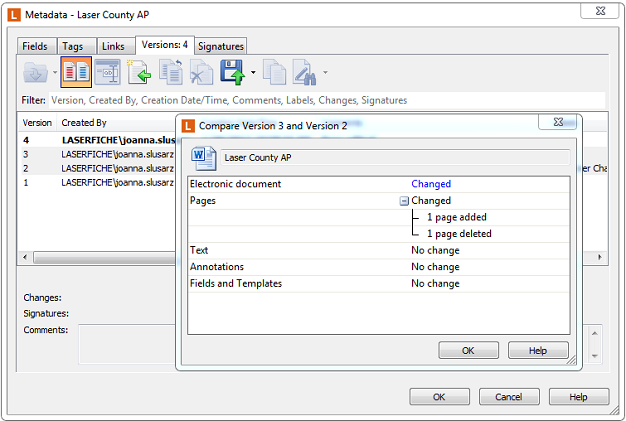 Laserfiche users can then retain and review older versions of a document, compare the differences between two versions, or revert to an older version if users want to discard changes. 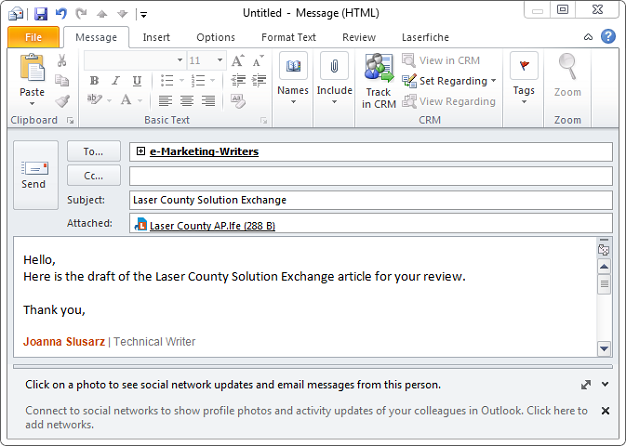 Here is how I use document versioning in Laserfiche to write new articles for the Laserfiche Solution Exchange. 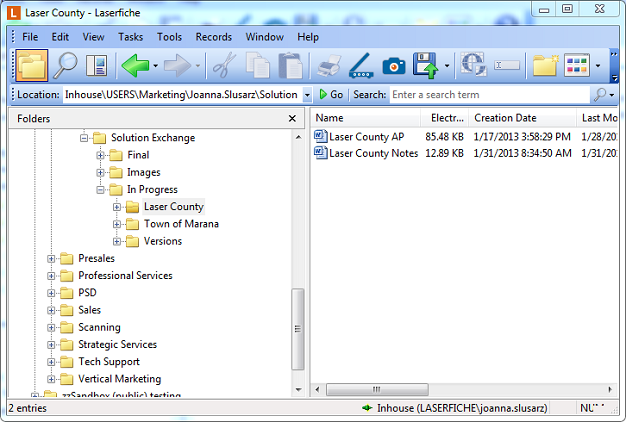 I store all of the Solution Exchange articles in the Laserfiche repository in an individual folder. All of the notes and the article drafts are stored in this folder. I have enabled version tracking on my main “In Progress” folder so that all of the new documents that appear in that folder and sub-folders have versioning automatically applied. This allows me to store multiple drafts of the article in the same document file. Every Solution Exchange article begins with a first draft. After I learn about the customer’s solution either by a phone interview, watching his presentation, or by examining his workflows or business process diagrams, I write the first preliminary draft in Microsoft Word. 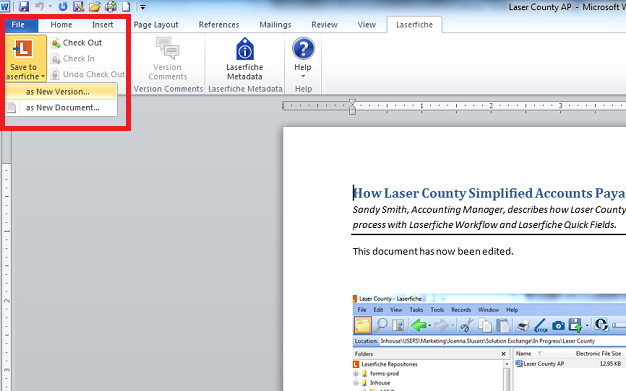 Once completed, I drag the file into the folder in the Laserfiche repository. I e-mail this draft to the customer asking him to review the content and make any edits he sees fit. I also send him some additional questions and requests for screenshots. When the customer replies with answers and edits to the original text, I import the document into Laserfiche as a brand new version. I enter some descriptive information about the version in the “Comments” field. These comments can be then found in the “Versions” tab of the document’s metadata. They allow me to quickly see what information the version contains without opening it. Sometimes, the customer did not use the “Track Changes” option in Microsoft Word when editing my article. 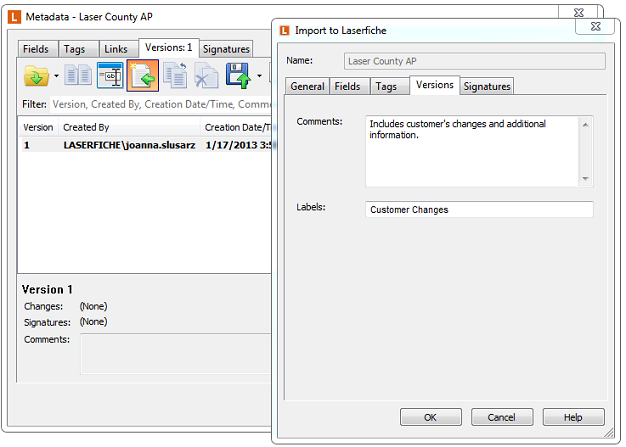 In order to see what changes were made, I can simply compare the two versions in Laserfiche. I select the two versions that I want to compare from the Versions tab in the Metadata pane and click the “Compare two selected versions” button. Since I am interested in more specific changes to the electronic document, I can simply click on the blue “Changed” link and the document is opened in Microsoft Word with the changes outlined in red, just as if the “Track Changes” option had been originally selected in Microsoft Word. 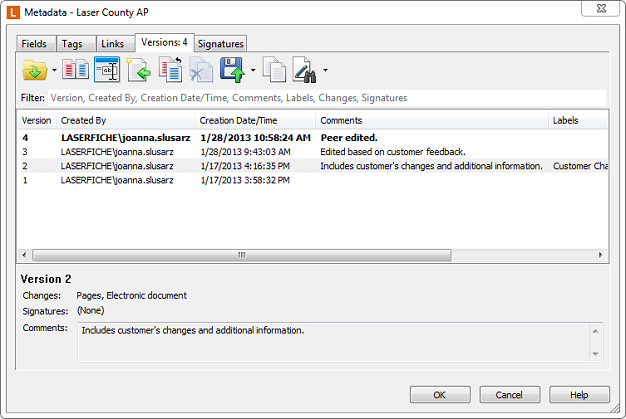 Please note that line-by-line changes are only available in Microsoft Word documents. With other electronic file types, the user will only be able to see that the electronic document has changed (not the specific changes). After viewing the changes, I check out the document in the Laserfiche repository, make the requested edits and revise it based on the supplemental information. While checking it in back to the repository directly from within Microsoft Word, I get prompted to enter a version comment in order to save this as a new version. 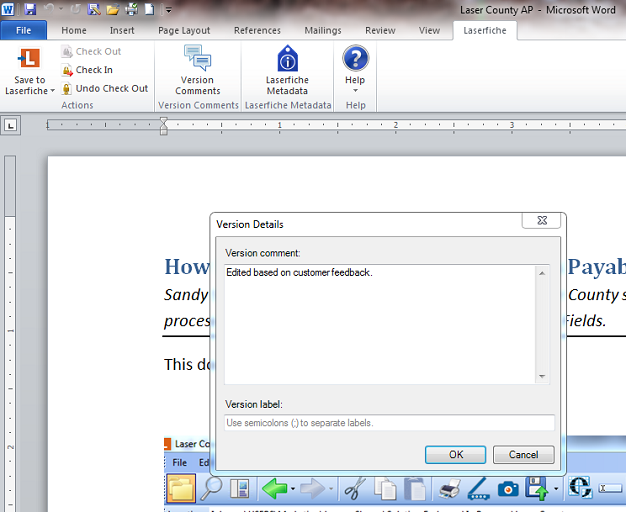 Laserfiche writers always peer review each other’s work. 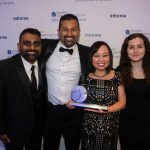 After I’ve made the changes based on the feedback from the customer, I simply e-mail the Laserfiche link to a fellow writer, and she is able to open it directly from the e-mail in the Laserfiche Client. Once the other writer makes the edits, she’ll submit this draft into Laserfiche as a new version directly from the Laserfiche tab in Microsoft Word. 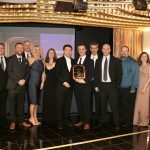 I’ll then revise the article and save it as a new version in Laserfiche and e-mail a copy to the customer for his final approval. If, at any time I would like to look at the original changes the customer had made to the document, I can simply open a previous document version directly from the metadata pane. 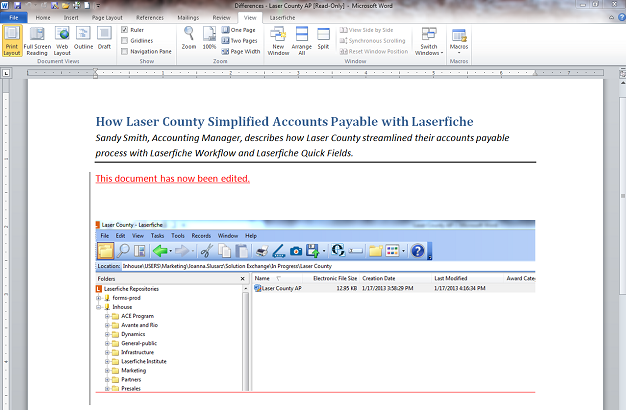 My Laserfiche folders are organized and uncluttered by multiple versions/drafts of the same article. All saved changes are backed up for easy recovery because older versions will always be in the history.